PHOENIX (AP) No. 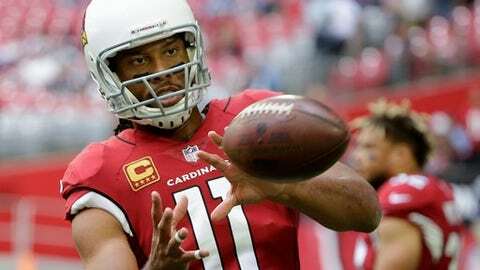 11 is coming back for the Arizona Cardinals. New Arizona coach Steve Wilks says wide receiver Larry Fitzgerald – arguably the most popular and certainly the most prolific player to don a Cardinals uniform – has told him he’ll return for a 15th NFL season. Wilks made the comment Thursday in an interview on the ”Doug & Wolf” sports talk radio show. Wilks says Fitzgerald told him of his decision in a conversation Wednesday night. So for at least one more season, Fitzgerald will be scooping in the throws – from somebody – and laying down some blocks for David Johnson. There was a quick response from teammate and golfing partner, cornerback Patrick Peterson. ”Wouldn’t be the same without him,” Peterson said on twitter, with a photo of Fitzgerald hugging him. Fitzgerald hadn’t said publicly whether he would remain for another season and there was speculation he might follow the lead of coach Bruce Arians and quarterback Carson Palmer, who both retired after last season. He returns even though there is no quarterback on the Arizona roster. General manager Steve Keim has said the team will move aggressively to fill that void, through free agency, trade or the draft – or any combination thereof. Fitzgerald has caught passes from 17 quarterbacks since being drafted No. 3 overall by Arizona in 2004. Although Jerry Rice’s NFL career records are out of reach, Fitzgerald has a good shot at moving up to No. 2. He needs 92 catches to top for second in career receptions and 390 yards receiving to pass Terrell Owens for No. 2 in that category. Fitzgerald has one year and $11 million remaining on his contract and most indications were he was leaning toward giving it at least one more season. New offensive coordinator Mike McCoy said Fitzgerald was the first player he reached out to and that the receiver said he was excited about the prospects of the coming season. Fitzgerald has missed only six games in his career and has caught a pass in 211 consecutive contests, tied with Tony Gonzalez for second all-time. He has topped 100 catches and 1,000 yards receiving each of the alst three years and, last season, was selected to the Pro Bowl for the 11th time. Among wide receivers, only Rice has been selected more often. He shared Walter Payton NFL Man of the Year honors with Eli Manning a year ago.